Liverpool have strengthened their backroom team by hiring Steve Peters, the sports psychiatrist who inspired Sir Chris Hoy, Victoria Pendleton and Bradley Wiggins to Olympic cycling success. Stirling University maths graduate Dr Steve Peters taught for 8 years before becoming a doctor and psychiatrist working with men with severe psychiatric disorders. Now he’s best known as the GB cycling team ‘mind mechanic’ behind the success of Olympians like Victoria Pendleton and Sir Chris Hoy. In this fascinating programme, he sits in the Stark chair and talks to Edi about what’s made him and his elite athletes turn their lives around. There is, he says, a chimp in all of us who has to be managed. Liverpool manager Brendan Rodgers has brought in the psychiatrist in an attempt to improve the mental strength of players and staff at Anfield as they bid for success. In addition to working with Hoy and Pendleton, he helped Ronnie O’Sullivan before his victory at this year’s World Snooker Championships and was also employed by Craig Bellamy when the forward was at Anfield last season. Bellamy credited Peters with helping him improve his form through teaching methods that encourage sportspeople to think more rationally under pressure. Liverpool’s players will be free to choose whether to use his services. “We have brought in someone who is the top guy in his field, one of the leading guys in the world in what he does,” Rodgers said. “I see it as a part of the development of the player. “The modern game is very much about the psychological aspect of it. Rodgers is also hoping that Peters will help him as a manager. “Command can be lonely and it is always good to have other people to turn to when you are trying to lead the club forward,” he explained. “I have my staff around me and they are outstanding, but it is always nice to have a different set of eyes with different experiences. “I have always used neurologists, but I took my time when I arrived here to make sure we could get someone who could really help performance. “This guy is of that level. “I would stress it is not a psychologist. REAL MADRID’S Jose Mourinho is the highest paid football manager in the world while Sir Alex Ferguson, who has just celebrated 26 years at Manchester United, is the best paid football boss in Britain, according to a new ranking. Brazilian sports business consulting firm Pluri Consultoria has ranked what they consider to be the highest earning 30 bosses in the game with former Chelsea manager Mourinho sitting pretty at the summit, allegedly earning £12.3m per year. More Special Wonga, than Special One! 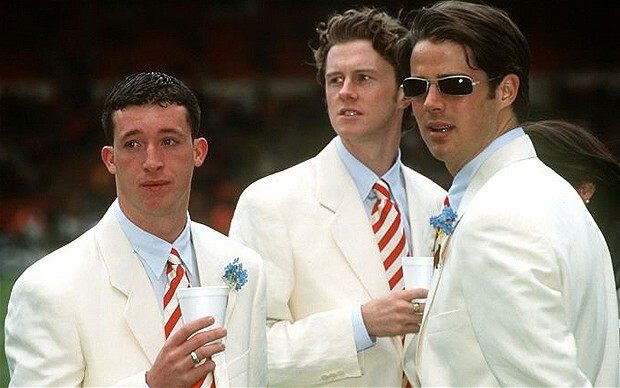 Former Liverpool striker Robbie Fowler has revealed that he will loan out his famous white suit to a museum in Manchester. The 37-year-old and his teammates hit the headlines in 1996 when they turned up to Wembley for the FA Cup final against Manchester United wearing bright white suits. 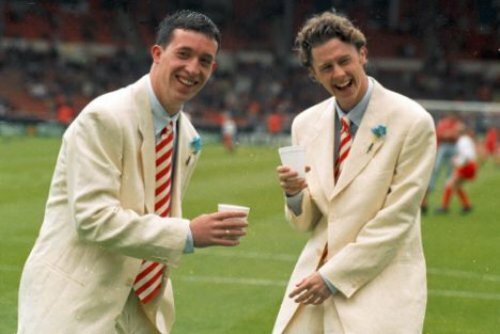 “I’ve still got [the suit] and I’m going to loan it to the National Football Museum in Manchester for an exhibition they’re doing on fashion in football,” Fowler said in a Q&A session with BBC Sport. The unlovely suits, inexplicably paired with sky blue shirts and a diagonally striped red and white tie that would shame the worst dressed, heaviest-smoking turf accountant, became the iconic and lasting image of a generation of tabloid-courting underachievers at Anfield. The group would remain nearly men under Roy Evans, but that reputation is disputed by Steve McManaman, who said: “The Spice Boys at one time consisted of eight or nine players and the press just used to change the personnel as they fancied. “It was unfortunate because when we finished third in the league we got a lot of stick for it. At the time I felt very sorry for some of the lads involved. But it didn’t bother me personally as I was playing very good football at the time. “When we finished third and people saw us having a laugh and a joke, they thought we didn’t care. Nowadays, when you finish third, everyone is thrilled to bits, everyone’s excited about qualifying for the Champions League. Top 10 Moments Of Football Managers Losing Their Rag! Check Out the Top 10 Moments Of Football Managers Losing Their Rag! Under the influence of Sir Alex Ferguson mind games, Kevin Keegan loses it in spectacular fashion during the 1996 title run-in. 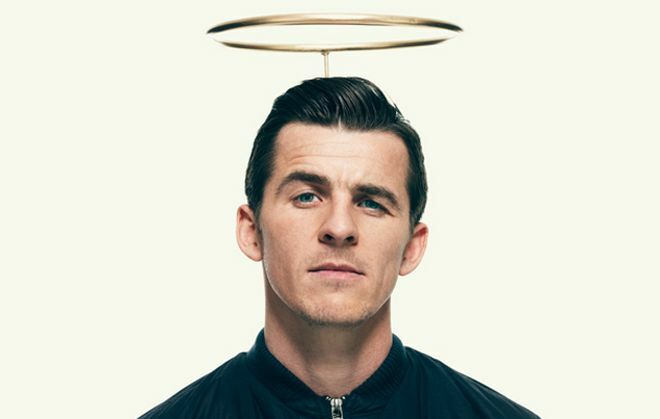 QPR loanee Joey Barton finally made his league debut for French outfit Marseille on Sunday, helping his side move level on points with leaders Paris Saint-Germain in the process. Barton wasted little time in picking up his first caution in French football, as the QPR midfielder was booked after 22 minutes for a strong challenge on Florent Balmont. But the Englishman settled well into the match, and so too did Marseille. Very bizarrely though during a post match press conference when answering questions from the local press he talked with a weird French accent. “Steve MaClaren eat your heart out…,” Barton quipped on Twitter, referencing former England boss Steve McClaren’s use of a Dutch accent after he took over at FC Twente for the first time in 2008. “The alternative is to speak like a ‘Allo Allo!’ character which is choose. Its simply a case of you had to be there. #youstupidwomen! 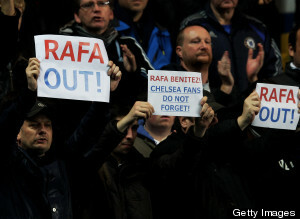 Fans protest over the signing of new manager Rafael Benitez, Chelsea v Manchester City, Barclays Premier League. 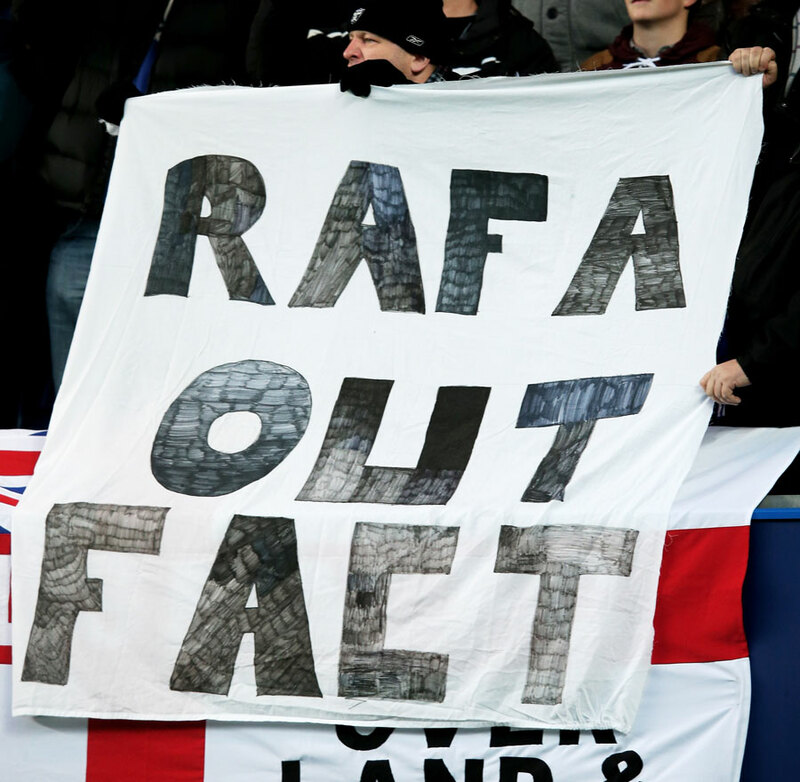 Rafael Benitez insisted he could not hear Chelsea fans booing after enduring a hostile reception at Stamford Bridge. 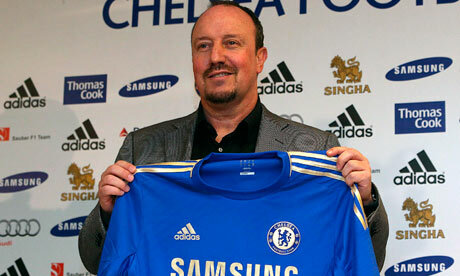 “I can guarantee because I was focused on the game I did not listen to the crowd,” Benitez told Sky Sports. “I don’t know if they said something or not. For me the main thing was team and their performance on the pitch. The Spaniard has signed a short-term deal having rejected Blues owner Roman Abramovich’s offer to take caretaker charge of the club in March after André Villas-Boas was dismissed. Chelsea hailed Benítez as a coach “with significant experience at the highest level of football, who can come in and immediately help deliver our objectives”. This video was taken at half time at St Andrews for the fa cup replay with brum. AVB had recently been sacked and the Chelsea fans were singing who they didn’t want replacing him.